Having snapped an eight-day winning streak in the previous session, the US Dollar regained positive traction on Wednesday and got an additional boost from better than expected US inflation data. The headline CPI slowed to 1.6% y/y in January, down from 1.9% previous but slightly stronger than consensus estimates pointing to a reading of 1.5%. Adding to this, core CPI held steady at 2.2% y/y and also beat expectations, which triggered a sharp spike in the US Treasury bond yields and eventually provided a goodish lift to the buck. Meanwhile, the shared currency was further weighed down by softer economic data, showing that the Euro-zone industrial production fell more than expected in December. The incoming softer data continues to fuel expectations that the European Central Bank (ECB) will remain highly accommodative through 2019, which coupled with the latest political uncertainty in Spain, the region's fourth-largest economy, exerted some additional pressure on the common currency. The EUR/USD pair tumbled around 80-pips intraday and refreshed YTD lows during the Asian session on Thursday, albeit has managed to rebound to 1.1280 as traders reposition for today's important release of flash German/Euro-zone GDP growth figures for the last quarter of 2018. Later during the early North-American session, the US economic docket, highlighting the release of monthly retail sales figures and PPI print, should further collaborate towards making it yet another volatile session for the major. From a technical perspective, the pair's inability to preserve/build on the attempted recovery clearly indicates that the near-term bearish pressure might still be far from over. Hence, a follow-through slide, back towards challenging Nov. 2018 swing lows, around the 1.1215 region, remains a distinct possibility. A follow-through selling has the potential to continue dragging the pair further towards its next support near mid-1.1100s. On the flip side, any attempted move back above the 1.1300 handle now seems to confront fresh supply near the 1.1325 horizontal zone. 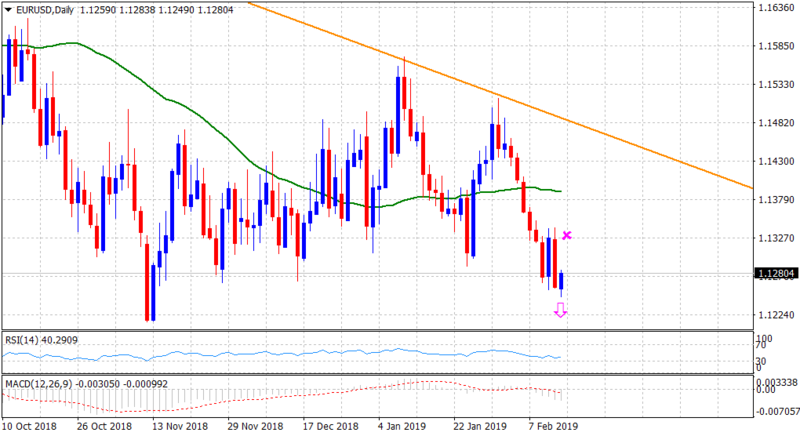 A sustained move beyond the mentioned barrier might trigger a near-term short-covering bounce, albeit any subsequent up-move seems more likely to remain capped at 50-day SMA, around the 1.1390-1.1400 region.